Sell & Buy Ty Beanies on eBay! On March 30, 1999 Clubby II was released, and what a grant entrance Clubby made! Clubby II first appeared on the Rosie O'Donnel Show. Rose was sitting on stage at a desk made completely of Beanie Baby Items. This one of a kind desk had a top make out of Beanie Baby Trading Cards, and sides that were covered with Beanies and Buddies! Rosie and Ty Warner both signed the desk and several other Beanie items and than auctioned them off on eBay with all proceeds going to For All Kids Foundation Charity. View the Ty.com newsflash regarding Clubby II and the Rosie O'Donnel show! This kit varied in several ways when compared to the first kit. This kit was contained in a silver vinyl case, this kit also included the Clubby II Beanie, unlike the previous kit in which you had to order the Beanie online. Collectors who bought this second kit were suppose to be able to order special offers from the Ty BBOC website, and those who had both club kits were suppose to find even more special and exclusive offers from Ty on the BBOC website. 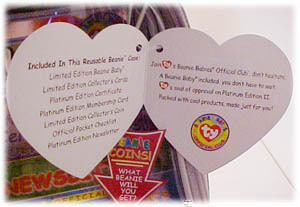 The kit contained of course Clubby II, the Platinum Membership Card, Platinum Limited Edition Beanie Baby Trading Cards, an Original Nine coin, a checklist, a certificate and a newsletter. 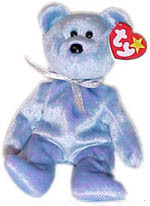 Clubby II has no button or symbol on his chest like the Clubby I Beanie. There are two versions of the Clubby II tush tag. 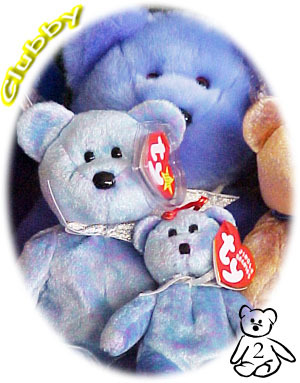 The first tag to be introduced had the name "Clubby" written on the tag, and the second version to be released was more technically correct and reads "Clubby II". Carry me in my platinum case! CLick for a larger view! 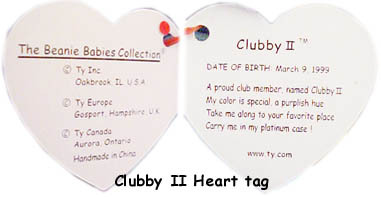 There are three different version's of the Clubby II Tush tag, the first version shown is the single tag, it doesn't loop, the second version is the stardard looped tag, and the third just says "Clubby" instead of "Clubby II". 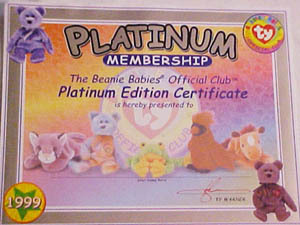 The membership card is what is used to give collectors special access to special offers on the Ty BBOC website. There are two different versions of the membership card, the first issue is dark silver color with a slightly rough feeling, the second version is much lighter and very smooth on the front. Each kit contained a coin, there was originally nine different coins available in the kit, Chocolate, Cubbie, Flash, Legs, Patti, Pinchers, Splash, Squealer, and Spot (without a Spot). 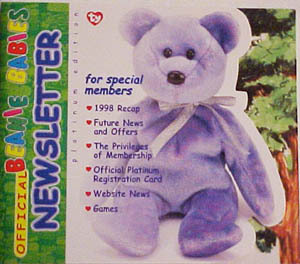 Five additional coins were added to the kits during September of 1999. They were Clubby, Peanut, Millennium, Mooch and Quackers. To make things more confusing in November of 1999 Ty added gold or gold/silver versions of the Spot, Squealer, Cubbie, Pinchers and Splash coins! For more details on the Cards & Coins Click here! Each kit contained a package of BBOC Limited Edition Collectors Cards, each package of cards had three cards inside. There are a total of 15 different cards, some are marked Limited Edition, some are Vertical and some are Horizontal Cards! There doesn't really seem to be any rare cards, you just had to buy several kits in order to get all of the cards (or trade cards online). 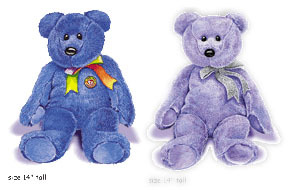 The Clubby II Buddy became avaliable on the BBOC website and either Gold or Platinum members could order him. Also during this same time period, if you were a Gold and a Platinum member you could also get 4 exclusive collectors cards of Clubby and Clubby II. Since both Clubby I & II were introduced at the same time Ty made a special offer, if you bought both Clubby's you would also receive a limited edition packet of Jigsaw Clubby Trading cards! This new offer was so popular that so many people called the hotline requesting the new buddies that many were often put on hold for long periods of time. Many people became frustrated with this so on August 14 collectors were now able to order both Clubby's on the BBOC website! 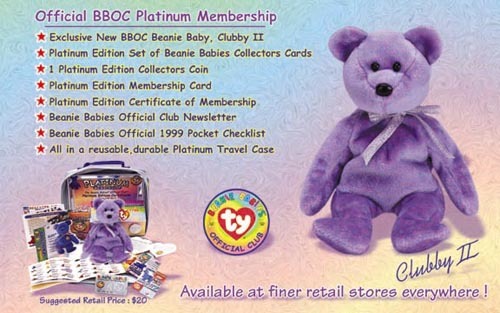 To ensure all BBOC Members have the opportunity to order the Members Only Exclusive Offers, the BBOC will be extending the Clubby Beanie Buddy and Clubby II Beanie Buddy offers through Friday, December 3, 1999. However, even with the new ordering system online only USA members were aloud to order. This upset a lot of people who bought club kits in other countries! This all changed on November 6th when Ty opened its doors to the other countries including the United Kingdom and Canada. Once a member ordered the Buddies they were told to allow 8 - 12 weeks for delivery of their order, however this turned out to not be the case for many members! During February of 2000, Cyrk Inc. (the company which dealt with and shipped the BBOC Official Merchandise) was forced to pay $216,000, as a civil penalty for failing to promptly deliver the buddies in the correct time period stated. The Federal Trade Commission, charged Cyrk Inc. for violation of a mail order rule that requires a merchant to ship a product by the time stated in advertisements, which was eight to twelve weeks, or by giving customers the chance to delay or cancel their order.